When it comes to a great SEO strategy, content is one of the most preferred ways to do this. It makes sense, too: get your content out there and the links back should surely generate some traffic. What many experts do argue on, however, is how much content is required. Some argue for producing more content, to help generate brand exposure and produce more links. Others, on the other hand, counter this and believe in less content… but at a higher quality. There is no right or wrong answer, of course, but it might help to understand what it is you want from your SEO services. If you want to improve your visibility, then a case could certainly be made for producing more content. After all, this well give Googlebots more opportunities to find your links and bump your position in the Search Engine Results Pages (SERPs). Of course, you can’t simply spam the internet, as search engines have long prepared algorithms to counter this. Likewise, you still need to be careful where you hand out your content. Is it somewhere relevant? If not, Google might still see this as spam. Is it on a high quality platform? If you’re appealing to domains with low trust factors and domain authorities, then this might not help you much either. Speaking of relevance, it helps to target these platforms because they overlap with your intended audience. Sure, a certain platform might be high and important enough to make a connection with but, if their audience has no interest in your product, those links aren’t working in your favour. Sure, you might get some traffic, but this is not the kind of traffic that you can convert into paying customers, subscribers or followers. If you’re looking for a high conversion rate, then this is what you need to focus on – not the click through rate (CTR). Would you rather have 1000 new people visit your website, or 100? Depending on the conversion rate, and your personal goals, you may very well want the 100, if they’re coming from the right place. On the other hand, it might also be possible to generate interaction with users, whether this is through online discussions, social media or simply giving people a means to start a conversation. This is why many an SEO agency will devote time to infographics, larger pieces of tailored content and interactive elements (such as quizzes). Done right, these can get people to enjoy themselves, to engage with your brand and even share the content with your friends, generating links and traffic for you. Again, this is also the question of relevance. If you’re creating content discussing niche topics in your industry, or producing quizzes that assess a reader on their own knowledge/involvement in that niche, then you’re directly grabbing the attention of people involved in your industry. In other words, the people you want. Of course, ultimately, all of this depends on your own personal goals. 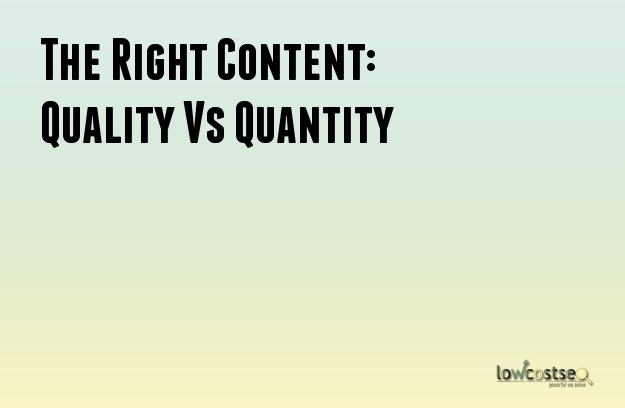 Producing lots of content certainly has its own benefits, but it is always worth remembering that, in many cases, less content can do a lot more.